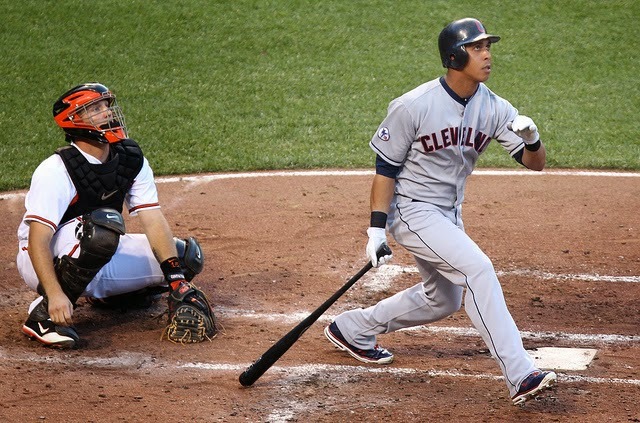 Michael Brantley leads Cleveland's offense, but watch out for their pitching. The annual "Battle for Ohio" begins tomorrow night. In the past, this has sometimes been a battle between two legitimate contenders. Or, at the minimum, a battle between a legitimate contender and a team that is trying to get back in the race. This year, it's a battle between two disappointments. How's that for a headliner? This preseason, the Indians were a fairly trendy pick as a team on the rise. They have fascinating talent in the starting rotation and a mix of talented youth and veteran position players. So far, at least, it just hasn't come together. A lot about how you evaluate this team will come down to how you evaluate players. The starting rotation, in particular, has put up extremely strong peripherals...but their actual results haven't been pretty. You don't see a split of almost 50 points between ERA- and xFIP- on a team level very often this deep into a season, but that's what the Indians are dealing with thus far. Their fielding rates out as pretty bad, which I think was expected, but not so bad to explain that kind of split. Most of the time, when players show these kinds of numbers, one can predict a significant rebound. Their position players have hit pretty well so far, though probably not enough to really overcome their fielding struggles. The team has some interesting ideas in their roster construction, however, which I'll mention below. Despite the poor start, the projection systems still like Cleveland to improve. And they've been playing better of late; less than a week ago, they were a sub-0.400 team. As a result, they still have legitimate playoff aspirations. This is bolstered by the fact that their top-shelf catcher Yan Gomes is apparently getting closer to a return. That will be a nice shot in the arm for this team. The thing I like about the way the Indians have constructed their roster is that there really aren't any wasted spots. While we likely won't see it, because the Reds don't have any left-handers in the rotation, they are currently doing a platoon that gets Mike Aviles and Ryan Raburn in the lineup against lefties. Aviles, in particular, can play just about anywhere. The catcher spot is always a shared position. And David Murphy has almost always been a legitimate offensive threat, especially against right-handed pitchers, and has been important as they weathered Nick Swisher's absence earlier this year. The result is that they can mix and match their players, taking advantage of platoon advantages, and (ideally) putting their players in the best possible situation to succeed. This is the kind of thing that the Rays and the Athletics have been doing in recent years, and I think it's something we'll continue to see with teams; they'll treat fewer and fewer players as "starters," and instead use platoons to simultaneously leverage their talent, keep players fresh, and ensure a solid bench. You have to invest more in your "bench" players this way, but you also don't really have to pay for starters. You can can hide guys who can't hit same-handed pitching by pairing them with an opposite-handed player who has the opposite problem. You don't need guys to be everyday players when they can be platoon assets. It's sort of the opposite strategy to what the Reds have been doing under Jocketty. Other things: Jason Kipnis seems to be back. Michael Brantley exploded last year as a 6-fWAR player after many years as a post-hype sleeper, and, if anything, appears to be even better this year. I mean, sheesh, here's a thing: he's walking almost twice as often as he's striking out. He's never really been a patient hitter and has always made good contact, but people are afraid of him now and he's being patient in turn. And more than that, you just don't see guys with .200+ ISO's and 6% strikeout rates very often. He just looks amazing. 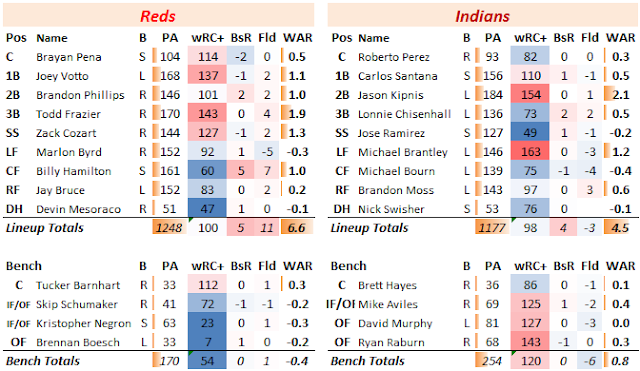 But most of the rest of the team, save for Ryan Raburn in his platoon role, hasn't hit much yet. I'm kind of bummed that we don't get to see Danny Salazar, but the three pitchers the Reds do draw are still really interesting. Carlos Carrasco looks like a fairly extreme, classic case of a guy who's gotten massively unlucky. He's talented, and his peripherals are almost as good as Corey Kluber's, but he's been hammered thus far. Reigning Cy Young winner Corey Kluber had been having a rough season as well. But two starts ago he struck out 18, and then he followed it up with a second dominant performance earlier this week. He'll be tough. Finally, we have the always-fascinating Trevor Bauer. If you haven't, go back and listen to August Fagerstrom's excellent FanGraphs interview of Bauer from last August. He has a lot of interesting ideas about how to pitch; once you get past the jargon (which was intially eyeroll-inducing), I thought his specific ideas about how to determine what pitch to throw were really interesting. As a baseball fan, it's a fun rotation to watch. 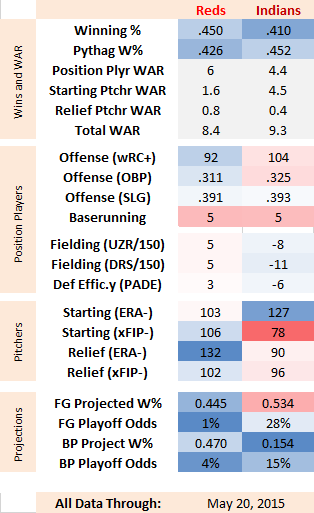 As a Reds fan, I'll be hoping to see some improvements from DeSclafani; he's going to have to get his walk rate under control, though my impression is that his stuff has been too hittable when he has gone into the zone of late. The hits off of him in his last start weren't cheap ones. Maybe it's because their starters have been hit so hard, but it doesn't seem like there have been a lot of high-leverage innings for this bullpen. Their main cog, closer Cody Allen, has not had a good season thus far, though he did manage to avoid not messing up Kluber's amazing starter the other night. I've always liked Marc Rzepczynski. Maybe it's the name. Maybe it's because I once drafted him in my deep fantasy league. But he's the principle lefty threat in their bullpen who is not assigned to mop-up duties.